I definitely didn’t know what to expect when I started this film. I didn’t know anything about it, from the plot to the characters. Unfortunately, the film wasn’t a pleasant surprise and certainly fell way below what I would have expected from it. It’s a shame since the film could have been good if it just had a better all around staff. The end product is just rather boring and aimless. It drags on and on and on. Asuna is an everyday kid who knows how to take care of herself. She performs all of the chores and keeps her house in order since her Mom is typically out. One day, she witnesses a battle between a mysterious kid and a giant monster. They quickly become friends, but the kid is murdered soon after. Asuna doesn’t know what’s going on, but then the kid’s younger brother Shin shows up. He wants her crystal so one thing leads to another and she jumps through a portal with him to another world. Her substitute teacher, Ryuji, decides to come as well while he lets his comrades murder a poor monster that chose the wrong place to hang out. Despite realizing that Ryuji is a murderer who sold out his comrades and is keeping her prisoner, Asuna doesn’t take it personally. She hopes they can still be friends, but what is she even doing here anymore? The film’s pretty aimless as I mentioned. Ryuji’s here to bring his wife back to life. If he can murder enough people, maybe he can get into the under world and find her. Of course, it won’t be so easy, but he is ready and willing to sacrifice Asuna to do this. Shin wants to help his corrupt village get their pendent back and is ready to murder everyone to do this as well. Asuna is really just here for the thrills and maybe she can see the dead kid again this way. There are no likable characters here and once again it is a story where you just feel bad for the animals. They didn’t ask for this, but the humans are always picking on them anyway. What makes Asuna unlikable is the fact that she hangs out with Ryuji after everything he did. She seems completely oblivious to life in general and makes all of the wrong decisions. She is supremely annoying and grating to watch and if she even had a sliver of personality then she would have been a far better character. Even if the personality made her a jerk, at least it’s be something. She’s like a blank slip of paper in this one. Ryuji is evil even if the film doesn’t always try to portray it that way. I couldn’t sympathize with him one bit even if his goal is one that I typically don’t mind for villains. If he wants to do this, then he should go all the way and accept his role as a villain. The fact that the movie portrays him to still be a decent guy otherwise is just annoying and I didn’t buy it. Shin’s also pretty generic. At least he helped out when it counted, but he’s just soooo weak. How could he let himself get one shotted so many times in one film? It was particularly embarrassing when he tried to stop Ryuji, but couldn’t. The film went out of its way to mock the concept of a child hero as he thought he was a great warrior, but ended up just being a kid in the end. It was easy for Ryuji to take him down. There weren’t any other real characters here aside from random villagers and Asuna’s human friend. They didn’t get to really do anything. I’d say that the film was just too long. You’ll get bored after a little while and the fantasy elements take too long to really turn into anything tangible. The nightcrawler things were interesting as they suddenly showed up and kidnapped Asuna. More creatures like that could have been fun, but the sad fact is that the majority of them were animals that couldn’t fight and just existed to get slaughtered by the humans. The animal violence is naturally a huge reason why the film was really bad. They gunned down an animal for no good reason and this was the government. It’s all rather vague which is supposed to be interesting, but I wasn’t invested enough to care. Why does the government want this mystical land and how do people know about it? Why have they not sealed off the exits so the fantasy people don’t just come to the human world whenever they want? You can wait for the answers, but they’ll never come. It was always surprising when someone would get slashed and blood would appear. It always felt a little out of place, but it’s not excessive or anything. I wouldn’t really count it as a negative, but the animal part makes that irrelevant anyway. The first thing you’ll notice is that the animation isn’t all that good. It’s not bad, but it has that soulless look that you may have come to expect from Westernized anime or as I like to call them “General audience” anime. It’s something that can be hard to describe, but it’s just a style. 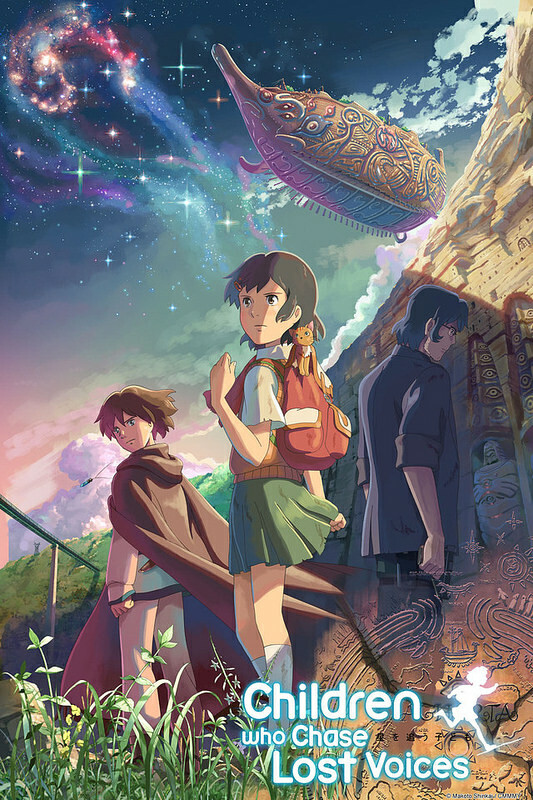 Look at Spirited Away or this film and then look at the latest DBZ or Naruto film. The latter you can instantly tell is an awesome anime film while the former titles look more see through and American. However you describe the difference, I always prefer the latter. It just looks a whole lot better. This film still looks decent by American standards though. We do get some action scenes here and I suppose the animation tries its best, but it certainly doesn’t do much to help the film. Likewise with the soundtrack as there aren’t any interesting themes here. I can’t say that I’m very surprised though. Not too much of a knock on the film, but you wouldn’t expect it to have any cool tunes. That’s just the kind of film it is. Overall, Children Who Chase Lost Voices was absolutely a flop. Animal Violence + Annoying characters is always going to equal a loss in the end. The film was way too long and just got to be boring by the end. You’d definitely be changing the channel if this ever comes on TV again. None of the monsters were all that impressive when it comes to their power and the ending is like another laugh to the viewers. It seems to be a running gag that the heroine loves to go back to Earth and act like the whole thing never happened in the end. It was fitting for this film though since we’ll all just try to move on from this title. It’s definitely not one that I’d recommend. You should go watch a Dragon Ball Z film instead. This entry was posted in Animated Movies, Live Action Movie Reviews, Reviews and tagged Animals, Anime, Beasts, Children Who Chase Lost Voices, Fantasy, Film Review, Movie Review, Review by dreager1. Bookmark the permalink. Finally, a TRULY honest review of this movie. The movie itself just seem uninspired and the Characters themselves weren’t fleshed out enough to care for the weak plot that was there. Seems like a cash grab at the attention Anime is getting now. Again, Excellent review Dreager. Thanks! Yeah, the film just wasn’t that good. It really tried to be a nice mainstream title on the anime wave, but it just didn’t work out. Hopefully the writers can do a better job with the next one.